Beer. It is one of the most awesome things in life. This leads to a couple of important questions. One: how long can you survive on beer alone? Two: to what extent is beer a suitable replacement for water? Not more than a few months, probably. That's when the worst effects of scurvy [resulting from vitamin c deficiency] and protein deficiency would kick in... If you kept to a strict beer diet—and swore off plain water altogether—you'd likely die of dehydration in a matter of days or weeks, depending on the strength and volume of beer consumed. There's plenty of water in beer, of course, but the alcohol's diuretic effect makes it a net negative in terms of hydration under most conditions. One experiment, in particular, lends credence to the first half of Singer-Vine's hypothesis: in the 1920s, researchers fed two Rhesus macaque monkeys with 200 milliliters of India pale ale per day, and some other foods lacking in vitamin C — within 2 months the monkeys were exhibiting symptoms of scurvy. But what about the second half? The part about dying of dehydration? This brings us to our second question of whether or not beer is a suitable replacement for water. Singer-Vine suggests the answer is no — but some recent experiments suggest otherwise. It you actually go to Professor Garzon’s website at the University of Granada and look under his list of scientific publications, you won’t find this study because it was never published. There’s even a bigger problem with this. Professor Garzon actually denies beer has any better hydration effect than water. The second study (the largest to ever investigate beer's benefits for athletes) was published in 2011 in the journal Medicine & Science in Sports & Exercise, and investigated the health effects polyphenols – aromatic compounds found in beer and widely credited with health-promoting and cancer preventative properties. The study concluded beer reduced post-workout inflammatory reaction; increased support for the immune system; and could even help stave off a cold. But there was one big caveat: the study was conducted using non-alcoholic beer as the test beverage. Which brings us to the third study. Published in a 1996 issue of The Journal of Applied Physiology, "restoration of fluid balance after exercise-induced dehydration: effects of alcohol consumption," actually matches up pretty well with Garzon's Castillo's findings. As its name suggests, the study examined the effect of alcohol consumption on the restoration of fluid and electrolyte balance after exercise-induced dehydration. "Drinks containing 0, 1, 2, and 4% alcohol were consumed over 60 min beginning 30 min after the end of exercise," write researchers Susan Shirreffs and Ronald Maughan, who conducted the study. "A different beverage was consumed in each of four trials." The total volume of urine produced over the six hours following rehydration was not significantly different from trial to trial, though pee volume showed a tendency to increase as the quantity of alcohol ingested increased. Peak urine flow rate occurred significantly later with the 4% beverage. Increase in blood and plasma volume was slower when the 4% beverage was used to rehydrate, and — this is the important part — did not significantly increase blood or plasma levels significantly greater than the dehydrated level. According to the researchers, these results indicate that beverages with low alcohol concentrations have "a negligible diuretic effect" when consumed in a state of exercise-induced dehydration. The researchers conclude that recovering from a state of dehydration is effectively the same whether you're rehydrating with water, or a beverage containing up to 2% alcohol — though drinks containing 4% alcohol, they write, "tend to delay the recovery process." Of course, "delay" ≠ "prevent entirely," so what the researchers are actually saying is: yes, you can rehydrate with a beverage containing roughly 4% alcohol; you'll just recover more slowly than you would with a 2% brew in your hand. This is good news, as beers that are 2% ABV can be somewhat hard to come by. In the U.S., most reduced alcohol beers (aka "Light" beers, like Bud Light, Coors Light, and Miller Lite) come in at around 4.2% ABV, though there are some exceptions. Miller 64, for example, weighs in at 2.8% ABV, and Beck's Premier Light at just 2.30% ABV. At 2.10% ABV, Pearl Light (a beer we've never even heard of — probably because it's produced in very low volumes and sold in parts of Texas, Oklahoma, Arkansas, and, well, literally nowhere else — is one of the closest to the 2% ABV quoted by Shirreffs and Maughan. So is Windhoek Light (again: never heard of this before writing this post), which actually manages to come in right at 2.00% ABV. Didn't Egyptians Drink a lot of Beer? Were They Just Hammered Constantly? Well… maybe. First, let's put a thing or two in context. At percentages as low as those of Pearl Light and Windhoek Light, you're well on your way to the land of what were once called "small" beers, so-called for their meager alcohol content. Small beers are thought to have been a drink of choice among Medieval Europeans and North American colonists alike. 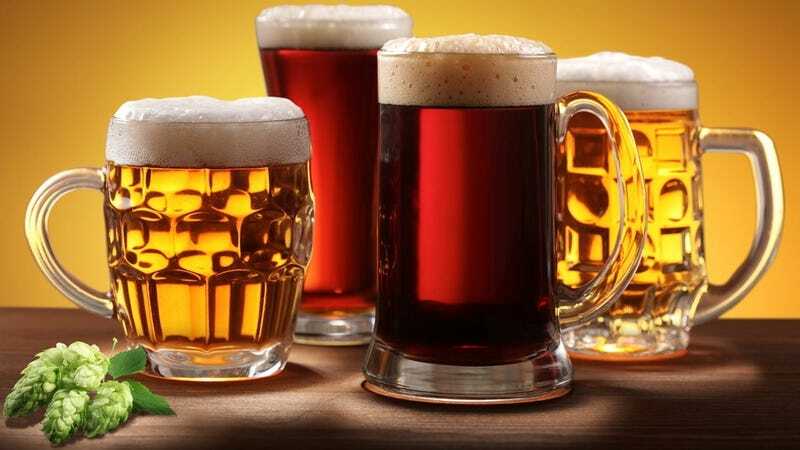 Commonly referred to as "porridge-like" in consistency, small beers were often unfiltered, and widely recognized for being hydrating and, to an extent, nourishing (with the added benefit of being more sanitary than water). In this way, small beer came to enjoy quite the following. Even George Washington was a fan — here's one of his recipes, straight from pages of one of his notebooks. The popularity of small beer hundreds of years ago inevitably raises questions about the consumption of beer in ancient Egypt, circa 1550-1070 BCE. Fans of Firefly may remember a scene from the episode "Jaynestown," wherein Simon compares the local drink known as Mudder's Milk ("all the protein, vitamins and carbs of your grandma's best turkey dinner, plus fifteen percent alcohol," according to Jayne) to the beer the ancient Egyptians fed to the slaves who built their pyramids. "Liquid bread," says Simon. "Kept them from starving, and knocked them out at night, so they wouldn't be inclined to insurrection." Disagreements on ingredients and brewing methods aside, Samuel says one thing we do know is that beer was produced in different strengths. Given our discussion of beer, hydration and nutrition thus far, we think its reasonable to assume that any beer provided to working slaves would have come from the less-alcoholic side of the spectrum. Hammered workers, after all, make for wonky pyramids. Of course, the real question is: if Mudder's Milk were real, how long could you realistically survive on that before succumbing to liver disease? Unknown. Though a feasible, if pessimistic answer, would probably be: longer than the typical lifespan of a Mudder.